With hindsight, by 1967, with the onset of new liberal Hollywood a studio Western with John Wayne, directed by Hollywood legend Howard Hawks, seemed a little obsolete and out of date. Hawks was known in Hollywood as an adaptive director, a populist auteur with an invisible style who could work in any genre and lauded by many great directors: Martin Scorsese, Peter Bogdanovich, John Carpenter and even Quentin Tarantino. 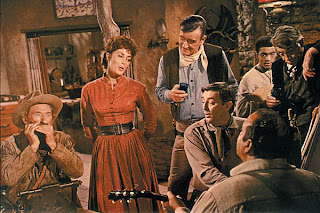 "El Dorado" was Hawks' second last film, and to no surprise it's a by-the-numbers Western featuring the swaggering John Wayne as a hired gun who enters into a war between local drunk sheriff (Robert Mitchum) and a band of bullies, headed by Ed Asner. Tagging along is a young James Caan, as Wayne's affable young protégé. For 1967, it probably provided enough adequate genre entertainment for audiences. There's a distinct over familiarity to the picture though. After a meandering first hour I figured it out, the second half has the same rhythm and focus as Hawks' "Rio Bravo" (for reasons I could never understand, one of the most revered pictures by those mentioned above). Hawks handles half-a-dozen key characters, confidently moving from comic relief to taut action and suspense. Although at 126 minutes it's 20 to 30 minutes too long. In the annals of cinema history though, it's an average entry in the genre. For Western newbies or even casual fans, without the stylistic stamp of authorship, like the mythological majesty of John Ford, the minimalist humanism of Budd Boetticher or the revisionist hyper-styling of Sergio Leone, it's a picture for old Hollywood cinephiles only. Paramount has packaged the film as a two-disc Centennial Collection, containing a wealth of extra material. Peter Bogdanovich, a marvellous anecdotal storyteller when it comes to film history, once again muses eloquently on one of the commentary tracks. Renowned critics Richard Schickel (Time) and Todd McCarthy (Variety) along with Ed Asner combine on the other running commentary. The seven-part "making of" on disc two is well produced and is more than just a recycling of older material.